The Konnekt One Touch Video Phone has an advanced touch-screen that lets you make a call with the touch of a single button! Each call button is large, clear and easy to read, and contains one of your chosen contacts. The call buttons can be named and arranged the way you want – for example, if you have a contact “Amanda Lee-Ferguson”, you could name the button “Aunt Amy”, “Big sister”, “Mandy”, or even something in another language such as “阿曼达”. To call Amy, you simply touch the “Amy” button. No numbers to remember, no menus, no icons. Our One Touch Video Phone is fast and easy. The Konnekt Videophone requires no training. It’s easier to use than your regular phone. There’s no keyboard, mouse or stylus. It has no logins, passwords or programs. There’s not even a handset to pick up or headset to wear. All you need is a finger. There’s not even a menu. That’s how simple it is! Unlike a tablet or a laptop, it doesn’t need to be turned on or charged, there are no programs to run, it can’t be misplaced, it won’t be taken to a room with poor Wi-Fi, and there are no batteries to go flat or annoying remotes to lose. When one of your contacts calls you, the Konnekt videophone rings loudly with a distinctive ring. The screen shows your caller’s name in big letters that are easy to read from a distance, so that you ALWAYS know who is calling. To answer the call, you simply touch the big green ANSWER button. If you decide not to answer the caller, you can either let it ring or you can press the big red REJECT button. 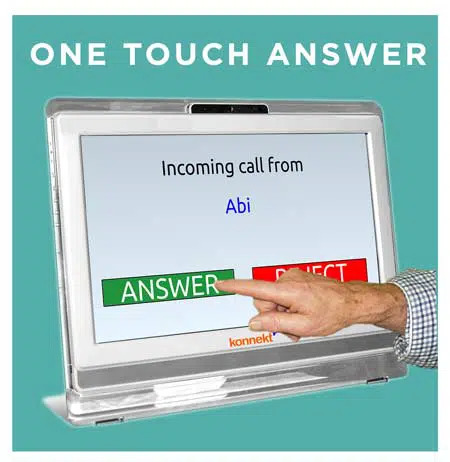 Konnekt’s One Touch Video Phone cleverly blocks calls from unknown callers, so you never have to worry about being disturbed or woken up by telemarketers, fraudsters or “wrong number” calls. You can also ask us to block incoming calls from selected known contacts, which is handy if you have a friend who sometimes disturbs you or calls when you sleep. 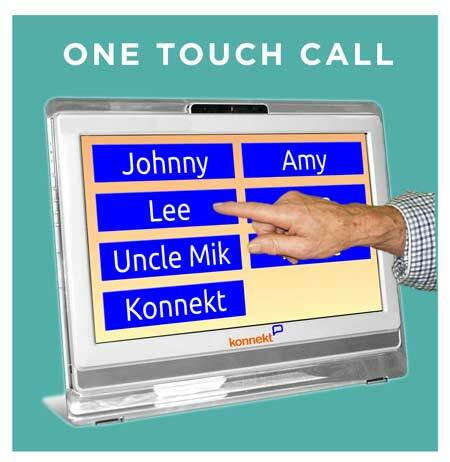 The Konnekt Videophone text can be customized in the language of your choice. Your Call buttons can even mix characters from different languages. How does it help those who are elderly? The Konnekt Videophone is LOUD and LARGE, and you can hear it ring several rooms away. Telemarketers and fraudsters are blocked. Nominated care-givers can be answered automatically, to reduce the worry. See Seniors applications.